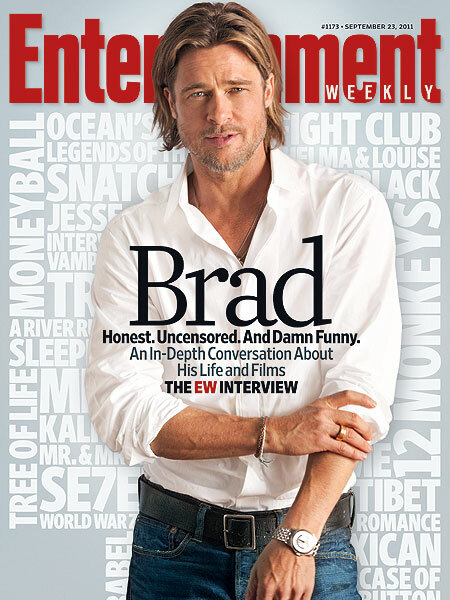 Actor Brad Pitt is the Entertainment Weekly cover boy this week, giving a rare, three-and-a-half hour interview about his career -- and life with Angelina Jolie. On meeting Angie on the set of "Mr. and Mrs. Smith," Pitt said, "We had some good workshops beforehand. Had some good laughs and ideas. That was just a great collaboration that turned into a greater collaboration." He also admitted he and Jolie may want to consider making movies together so they can have more time with their six children. "We should be doing them together. That's what we should be doing. We should be doing everything together, and then we could work less. We could have more time off." Pitt is currently in Europe promoting "Moneyball" and shooting his zombie flick, "World War Z."